If the capacitance humidity model is used, a humidity capacitance ration must be specified. It is a multiplier to increase the humidity capacitance due to the air in the zone and normally ranges from 1 to 10. It accounts for the humidity capacitance of the air plus any other mass within the zone. If it is one, only the humidity capacitance of the air is used. 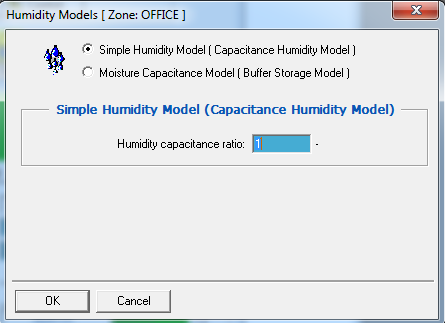 How should I calculate the humidity capacitance ratio of my building ? What is the typical range of it ? P Save a tree... Please don't print this E-mail unless you really need to.